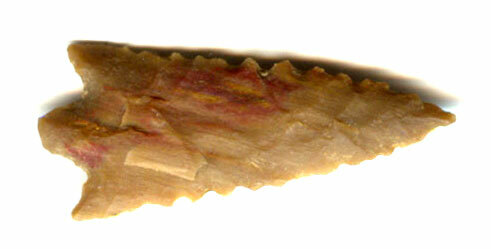 A Large Size, Colorful, Visibly Aged And Slightly Anciently Use Sharpened, Nicely Serrated Bassett Arrow Point That Exhibits Surface Aging Coloration And Stone Patination, Correct Narrow Pointed Stem And Overall Shape, Aged Surface Deposits, Visible One Side Age Extended Different Ground Contact And Element Exposure, Correct Material And Manufacture For The Area Found. Found By Ralph Nichols Near Lake O the Pines In Morris County, Texas. Ex-Ralph Nicholas, Billy Dixon And Kevin Farmer Collections. This Is An Excellent Example, Displaying Very Nice Workmanship! Includes A Ken Partain Certificate Of Authenticity.